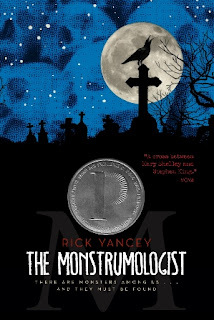 Rick Yancey's The Monstrumologist is the first book in a (currently two book long) series about Pellinore Warthrop, a monster hunter and his 12-year-old assistant Will Henry, in Victorian New England. Warthrop took Henry in after his parents died in a fire, and since then, Henry has been helping the doctor in his research. One night, a grave digger comes to their door carrying a terrifying beast, an Anthropophagus, and the doctor realizes that there are over 30 of these man-eating creatures living in his hometown. He and Will Henry set off on a race against time to hunt these monsters before they attack the whole town. This book was gory. Very, very gory. In a way that probably appeals to 14-year-old boys but definitely made me cringe and skim several paragraphs. There is great description of rancid teeth, bone-crunching, brain-bashing, limb-tearing... whew. It was much more than I expected. But I don't want to give you the wrong impression. The story was also wonderfully written. Yes, this book is targeted at young adults (I assume), but Yancey does not write down to them. There is impressive vocabulary in abundance- not limited to the monster name Anthropophagi. The writing style, too, was very reminiscent of Victorian era horror or Gothic novels. A lot of gloom and doom, tons of heavy foreshadowing, creepy and disturbing characters, and all the rest. Maybe the monsters and blood and gore draw the pre-teen boys in, but the writing is what kept me going. I do not enjoy horror stories. They freak me out, they keep me up at night, they disturb my dreams and generally create an unpleasant ruckus in my life that I do not seek out. But this one had such compelling writing and fascinating characters that I kept going. I say the characters fascinate me, but I don't know that I loved any of them. Well, I really liked Will Henry, the plucky orphan who comes into his own. I also had a soft spot for Dr. Warthrop, but he was not a very nice man. Really, most of the people in this book were not easy to like. They were self-absorbed, greedy, prideful and arrogant. Dr. Warthrop particularly could be grating. His oft-used phrase was, "Step to, Will Henry!" and by the third chapter or so, I was very tired of reading those words, particularly as they were said in a very autocratic and insufferable voice in my head. I don't know how Will Henry handled it. It's very surprising, actually, that I found this book as compelling as I did because usually if I dislike the characters, I dislike the book. But the writing style just drew me in so well here that I kept going. One thing I didn't like in this book and which I feel is becoming more "modish" recently (though I think it is originally a Victorian conceit so makes sense here) is the whole "Oh, I just found this bunch of letters/diary/message in a bottle/writing on the wall sitting here beside me one day, and decided to publish it and share with you." That is very much the set-up of this story, with the author being called into a mental institution to read journals that might be of interest to him. They are Will Henry's journals, the author is interested, and he shares them with the reader. I am not sure what the over-arcing story with that will be, but I personally don't see the point of these set-ups and could do very well without them. Overall, I enjoyed this book, though I found it very creepy and more than a little disturbing. I have the second book in the series, too, The Curse of the Wendigo, and I look forward to reading that one, too- though I have no time frame in mind to do so. The story kept my interest throughout, though I would warn you (again) that it's very gory! I am not so put off by gory, and I remember you saying that this was such a good read for you that I am going to have to try it out. Isn't it weird when there are no likable characters in a book, but you still really love it anyway? That has happened to me in the past few months with a couple of books. I just take that as a sign of great writing. I have to admit that you have made me more than a little intrigued about this book and I really want to check it out. Wonderful review, Aarti!! I've seen praises for this book, but I think I too would be put off by all the gory stuff. Amanda- Yeah. It's a lot. Zibilee- Yes, I did feel drawn into the story a lot due to the writing, but not so much the characters. It was a very interesting look at very flawed people. I hope to discuss it with you if you read it! rhapsody- Yes, it got really disturbing really quickly. I can't handle horror! I wonder if the Victorian, old-school style wouldn't actually serve to get young boys used to the style. Maybe they'd even be more willing to continue onwards to actual Victorian novels because they'd say, "Ah, well I know I can deal with this reading style. And it was so cool, too!" This seems somewhat unlikely for the majority of young men, but it would certainly be interesting if it succeeded. Ok I a totally off subject here.. I'm not much of a fan of the gore, either. It does have a cool cover, though! Aaurgh! I've always wanted to hear a story of the anthropophagi--Othello mentions telling stories about them, along with men whose heads are beneath their necks, or something like that. But I am a total wimp about horror stories. I think I am going to have to give this a try. Fourteen year old boy brains and my brain share some connections, I think. And by some, I mean a few, not many.